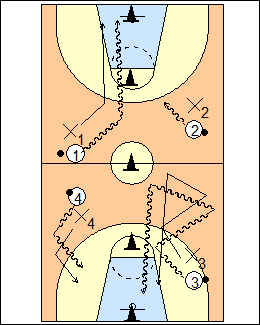 Divide the court into four quadrants, go 1-on-1 in each quadrant for 30-40 seconds (it depends how pissed off you are that day), each ballhandler can do whatever he wants, his defender has to stay arm's distance away, which is extremely difficult to do. This was the first drill he did every year in college, it set the tone for what they wanted to do. Find out if there are any dogs, and who would give up. 8-second drill (Online Basketball Drills) - defend a dribbler at a basket for 8 seconds. See Defending - Zig-zag, Dribbling - Mirror run.